after a hectical sprint, the 0.8.0 release is done. We have continuously reported on the progress, so the content of the release won't be a big surprise. Still, you can checkout the release notes on our forums. And if you are brave enough you can even try it out. The thing is that considering the circumstances the release will be "very" experimental. We have fixed all the major errors and crashes we came acrros. But still there were plenty of changes under the hood in non-trivial areas (namely the logistic system) so there are a lot of potential places for error. Just a reminder, you need to set "Enable experimental updates" in the "Other settings" for the builtin updater to update your version to 0.8.0. After a major release we usually take a day or two off. This time it will be no exception. Moreover it was Kovarex's birthday yesterday, so today in the evening we will have a party in our place. After the headaches are gone, the place is clean again and we recharge our batteries, we will be after the (supposedly found) bugs in 0.8 and planning the 0.9. It is kind of a never ending story:). Balancing - Roboport requires quite some energy to charge the robots. So the Logistic Robots will be less overpowered than they have been. Stationing - In the past robots without orders kept hanging at the place where they stopped. This was annoying and even caused robots to become a target for enemies after they delivered stuff to the player's inventory. Now every robot that has nothing to do goes to the roboport to station there. Area Separation - Before, all the logistic robots could fly all over the map. From the base to the expansion if necessary. Following the player fighting the enemy bases, etc. This was also less than desirable. Now the connections between the roboports define separate logistic networks which can't be mixed. This way, small independent systems can be setup in the expansions and one large network in the main base for instance. And on top of all that the roboports look really cool:D Albert happily took the break from the terrain and made a great machine in a short amount of time. You can checkout the "making of" animation below. Some of the instructional pictures in the demo were getting really outdated. So we replaced them with setups with the current graphics. 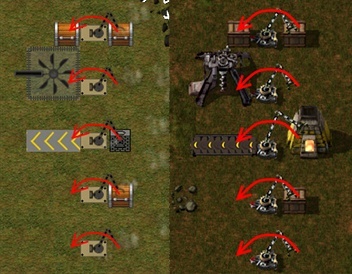 Below is a side-by-side comparison for the instruction on how to use inserters from some months ago and from now. The last picture is the courtesy to Kovarex's grandmother, who made this wonderful cake for his birthday. The tradition is the commenting thread on our forum.